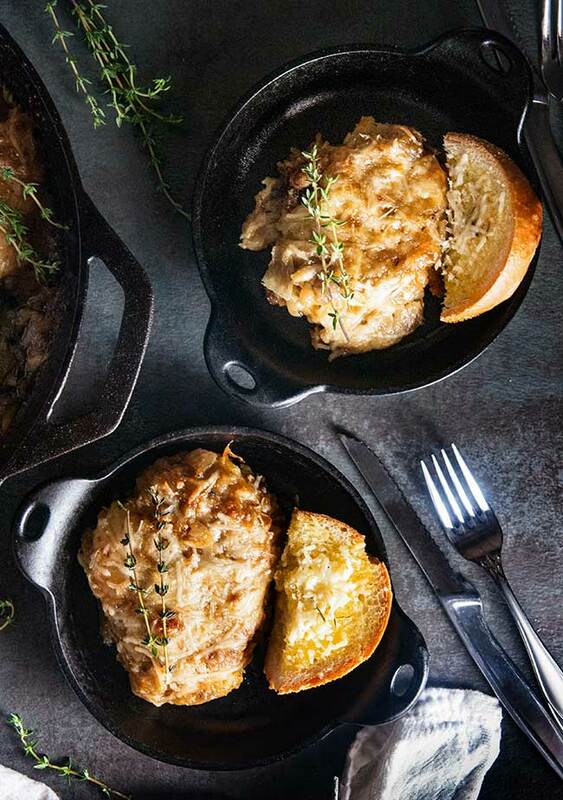 This French onion chicken. OMG. It’s my new hands down favorite. We’ve eaten it not once, not twice, but FOUR times in the last two weeks. And I don’t even really like chicken. Truth. I am not a chicken fan. It’s weird because I write a lot of chicken recipes. I like all the chicken recipes I make. I mean obviously. But go to a restaurant with me? Yeah, I’m the girl asking the waiter if he thinks the chicken is too chicken-y. Yep. So we’d get seated in this section in the back. Always in the back. We’d take up a whole room with our gear. I mean between ten new moms and 11 babies, we were basically a traveling Babies R Us. We almost always had the same waiter. Poor guy. He was so nice to us all, bringing us constant coffee refills or wine, depending on the day. He’d bring cups of hot water so moms could warm up their milk if needed. When the kids got a little older and started eating food, he’d bring out plates of plain peas. He was awesome and pretty much deserved the big tips we would leave him every week. You need that many onions in the French onion chicken. They will cook down a lot. Now of course, at this moment, all the babies were quiet. Peace had befallen our normally bustling table. And the other moms, most of whom I had only just met a few weeks earlier, heard my question. So not only did I have our poor waiter looking at me like I had two heads, I had a table full of other women looking at me like I was nuts. But this question was important. I had to know if the chicken was too chicken-y. Because nope, I will not eat it if it is. And chicken-y chicken will ultimately ruin chicken for me for awhile. 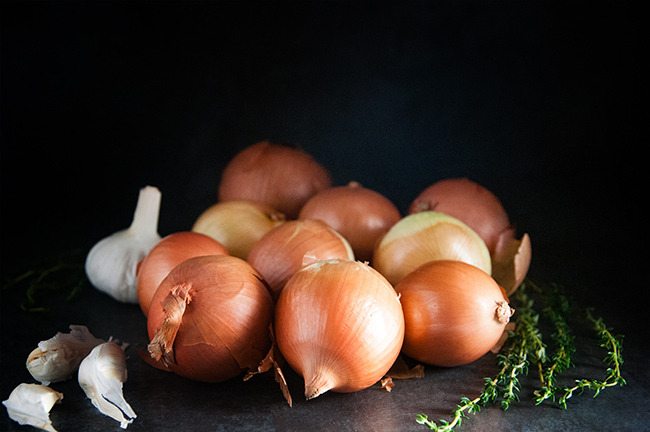 The onions turn golden and caramel colored when done. Thankfully, my ridiculous but totally legitimate question didn’t ruin my fledgling friendships with the other moms. Over the last three years, they’ve been a constant support network and become some of my dearest friends. Despite needing to know if the chicken is too chicken-y. 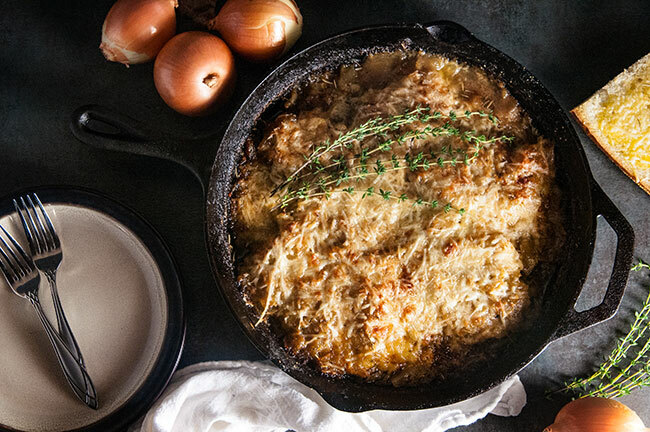 And in case you were wondering, this French onion chicken is anything but chicken-y. This chicken. It’s so full of flavor from thyme and garlic without being spicy. It also doesn’t have that weird texture chicken breast sometimes gets. Nope, this chicken is super tender. You can easily cut it with a fork. No knife needed. That cheese pull. Those onions. 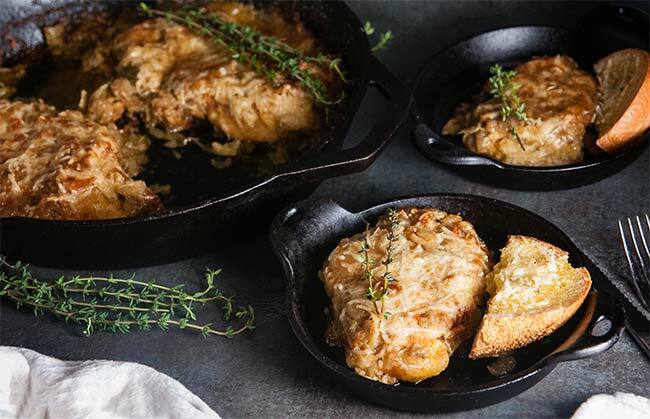 This French Onion Chicken. OMG. And those onions. Holy cow. Those onions are the stuff my dreams are made of. I am obsessed with them. 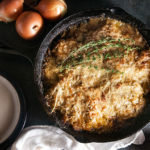 They are basically the onions from this caramelized onion cheese dip and this pizza and they are buttery and sweetly savory. Rich. Perfect except for the fact that they are a wee bit high maintenance. 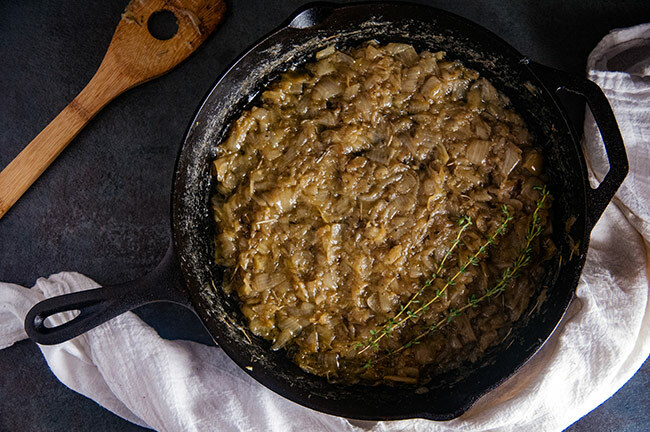 To caramelize onions, you have to put the time in. It’s not really hard, but it does require you to stand at the stove, methodically stirring so they don’t burn. It sort of reminds me of making risotto with its high maintenance stirring. 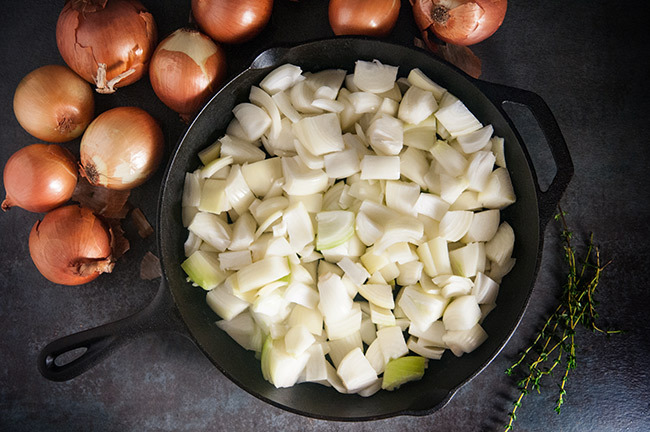 Like risotto, the onions demand you watch them and stir. It’s the perfect thing to cook if you just want to lose yourself in the kitchen for a little while. And because it doesn’t require a ton of mental energy, I highly recommend cranking up whatever music you like to sing along to and pouring yourself a glass of wine to enjoy while you stir. But that’s just me. 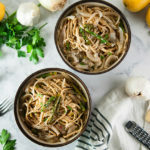 If you do want to include the chicken in your meal plan during the week, you can absolutely save time on a busy weeknight by making the onions ahead of time. The actual chicken itself doesn’t take long to put together. You can have that ready in under half an hour. And oh, did I mention, you are breading the chicken in cheese? Yep, cheese. 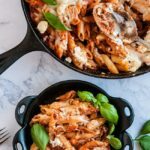 So bread that chicken in Parmesan and sear in a cast iron skillet. 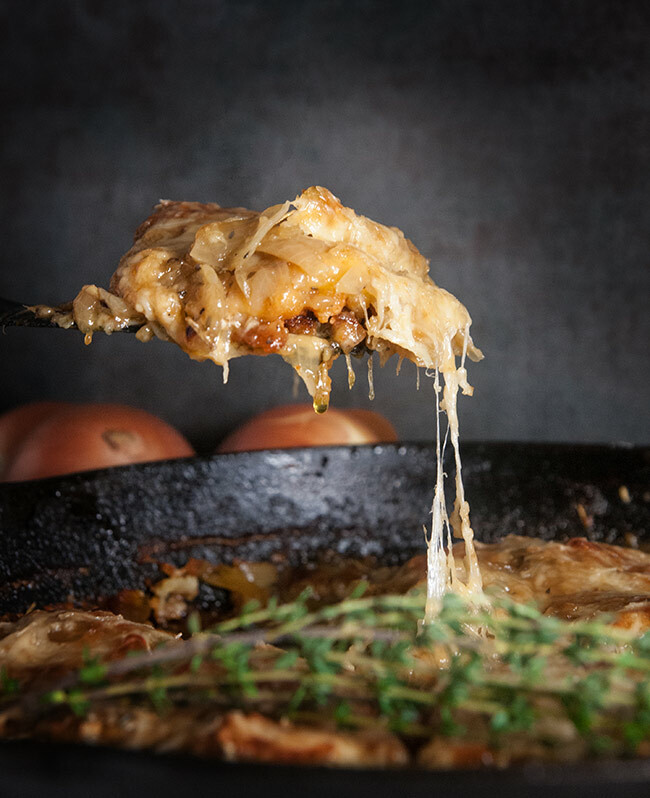 Then top with the demanding onions and lots of cheese and bake until it’s melty and beautiful. Then enjoy the least chickeny chicken in the world. In large cast iron pan, heat oil and butter over medium heat. Add onions, thyme, rosemary, salt and peppa, gaalic, and sugar and sherry. Cook on medium heat for about 45 minutes depending on level of doneness desired. Onions should be a light to medium brown. Stir with increasing frequency throughout the process. Towards end, stirring should be pretty constant to prevent burning. Remove from heat and set aside. Whip eggs, garlic, salt and pepper in small bowl or pan. In separate pan, add parm cheese, thyme, rosemary, and corn starch and combine. 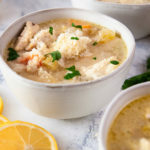 Drench slices of chicken in egg mixture and then pat parm mixture onto the chicken until well coated. In same pan you used to cook onion, heat EVOO over medium high heat. Add all chicken at once, creating a layer on the bottom of pan. If needed, add a bit more EVOO to make sure there is enough to sautee each piece. Flip after about 4 – 5 minutes or when edges have turned light to golden brown. Cook for an additional 2-3 minutes. Remove from heat. Spread onions over the chicken in pan. Add beef broth and top pan with additional shredded Parmesan or Italian cheese on top if desired. Bake uncovered for about 25 minutes or until onions have turned a golden to dark brown. You can make onions ahead of time. Just store them in fridge and add to chicken when ready. Swiss or gruyere cheese would also be awesome on top of this chicken. I am the only here who loves French onion anything so I look forward to eating it all myself! Hahaha you won’t be sorry! Haha! Love the Carraba’s story. Poor waiter. And your recipe looks delicious! That looks delicious! 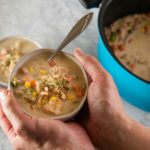 I love chicken, this is such a great recipe idea! Wow this looks and sounds yum! I like chicken quite a lot because of the endless (and fairly easy) possibilities… Gotta try this one. This looks incredible! I’ve pinned it and I plan on making it soon!! So tasty!! Definitely pinning this–thank you!